This beautiful Three Strand Horseshoe Necklace comes with a silver plated pendant and is set on three 18'' legnth strands. One is made from suede leather, the other of coral, and the third is a silver plated chain. 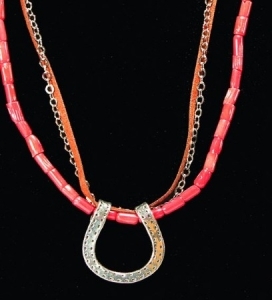 This os one of the most popular horseshoe necklace items.